Roger Ebert, the celebrated Chicago Sun-Times film critic and general good egg, recently won a New Yorker caption competition after 107 attempts spread over many years. He wrote a nicely dry column for the Guardian about it, which in the Web version, omits the actual cartoons. Ebert’s quest to win a competition is also covered in detail by the New Yorker’s cartoon editor in his blog, with the actual cartoons. To save you the effort, I have extracted the best ones here. 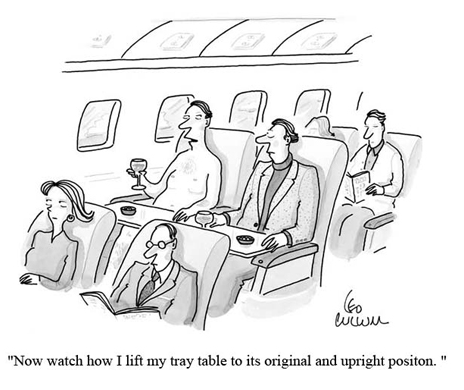 For those of you who are not familiar with the competition, every week the New Yorker publishes an old, uncaptioned cartoon, usually of a bafflingly bizarre scene. Appropriate captions are then solicited, with apparently a huge number of entries (over half a million people have entered). Sadly, the caption didn’t make it past the judging panel’s censors. And this one, which didn’t seem to offend, didn’t make it either. Why on earth not? The original cartoon showed a string quartet on stage, over which had run a monster truck. 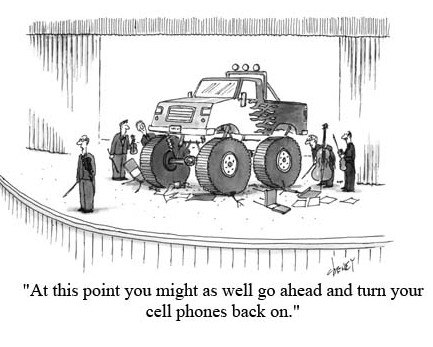 Here’s the cartoon and caption – which seems to be just perfect (particularly if you go to a lot of chamber concerts).